This was certainly both a necessity and the proper priority. The achievements in this effort are both real and measurable throughout the Southwest. Another important outcome of this effort is that it collected, educated, and motivated a large number of people to work on the issues that confronted the various populations of desert bighorn sheep. Now there are people and organizations that have a deep knowledge of desert bighorn sheep, and that are equipped with modern tools such as GIS mapping, radio collers with GPS, and digital trail cameras and so on. This places our society in a position to take environmental mitigation to a new level. The next step is terrain manipulation and modification on a species specific basis. Most of the time when we think of terrain modification we think of building bridges so that wildlife can cross a busy highway or an underpass to do the same, and perhaps wildlife friendly fences as well. However when it comes to desert bighorn sheep habitat we know that it’s is all about terrain. Now with the resources and knowledge available to us it’s time to think in a more imaginative way on this subject. We must affect such things as maximizing the utilization of available habitat, genetics, and lamb survival rates. These new projects will also collect, educate, and motivate a whole new generation of people to learn the ways of the desert and the bighorn sheep, thus keeping alive a more traditional view of the desert and desert bighorn sheep within the larger urban culture. The model that I’m presenting here is an orchestrated assembly of the various attributes that may be used individually or in some combination. Perhaps some time in the future there will be features like this, and their attributes will be studied and debated. Through this process, this technology will be refined into a useful tool for wildlife management and habitat mitigation. Here we can theorize and examine what might be possible and perhaps fire up the imagination of both individuals and organizations that deal with the conservation of desert bighorn sheep. One of the first things we have to understand about terrain modification is the wide range in size and scale. Sometimes when one is following a game trail he will find that a feature that’s just a foot or two higher than the rest of the terrain is utilized, and the same can be said for bedding sites as well. Then on the other end of the scale these artificial features could be 3 or 4 hundred feet long and 100 feet tall. Building such a large artificial feature for wildlife management might seem to be improbable. However when you consider the cost of building a freeway overpass for wildlife, the idea of building a large mound of dirt seems a little bit more probable. Then one must consider that in effect were already doing large-scale terrain/habitat modification with large-scale mining, freeways, and railroads. Now let’s discuss some of the various attributes in the diagram below, and let’s think of this mound of dirt on the smaller end of the scale, let’s say 100 feet long and 12 feet high. In this case this mound would’ve been built by scooping out the depression next to it. Now let’s start a discussion on the various attributes that this raised piece of terrain could have and it’s affect. To start with the shape in this diagram is just one of many shapes that could be utilized or found effective. In this particular idea there would be a long North and South slope and a deliberately designed wind shadow on the east end, perhaps to encourage a different plant community or bedding site. When the desert bighorn sheep got to this small island of raised terrain they could see if things were safe in all directions. They could also look down into the depression and see if there was anything there to threaten them. If all were safe they might choose to go down in the depression and eat some of the greener feed that might be there, before moving on perhaps to a distant mountain range. So in this case you would have both an advantageous viewpoint and green feed as an attraction to this feature, thus making their travel between mountain ranges more frequent and safer. On a large artificial terrain feature rocks broken pieces cement and other objects could be used to make a certain amount of the slopes into escape terrain, and the upper portion more suitable for bedding down. Now let’s turn our attention to the depression and the range of possibilities that are there. First we want to discuss the size and depth of this depression. Obviously the smaller in diameter and the deeper it is the longer the water will last. Then we have to decide if we want the water to last as liquid water or soak into the soil. If we want liquid water to last, it could either be clay or plastic lined. If we choose a design to conserve and provide liquid water it could have all sorts of ramifications, some not necessarily desirable in every application. Most predators that would prey on desert bighorn sheep are water dependent animals, such as the mountain lion the bobcat and the coyote. All these animals must have water in liquid form to survive. So an artificial terrain feature that can save liquid water might also attract predators. After monitoring such an artificial terrain feature a certain amount of tuning might be necessary. 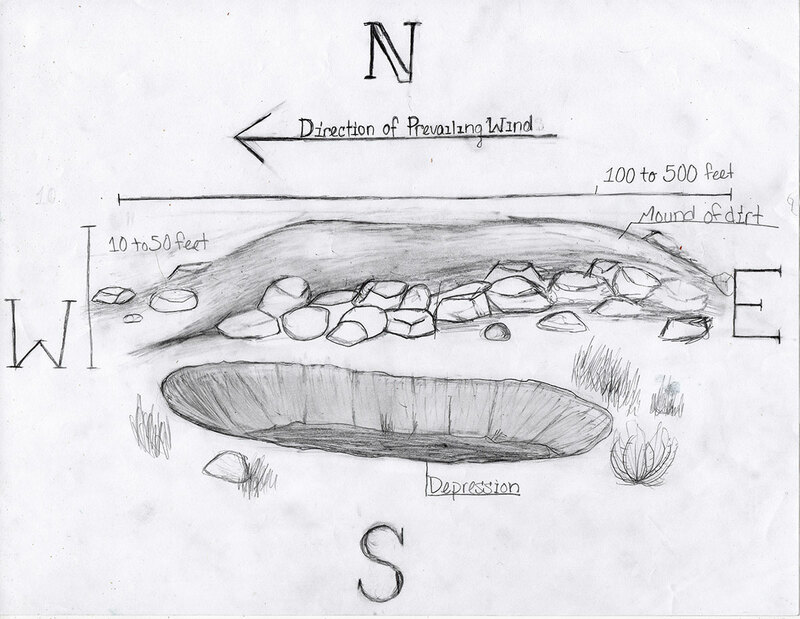 A terrain feature where the depression collected water but did not maintain a pool of water might actually have some advantages, the first being that it would not be a water source for the predator. Then the plants that grew in this water collecting depression would be greener and hold more water in their leaves and stems than the plants in the surrounding area. This would be a moisture/water resource for the desert bighorn sheep and not for their predators. Then one of the final considerations to take into account is scent. Most of the time the individual installation and the local environment will have to be considered to have any practical effect. 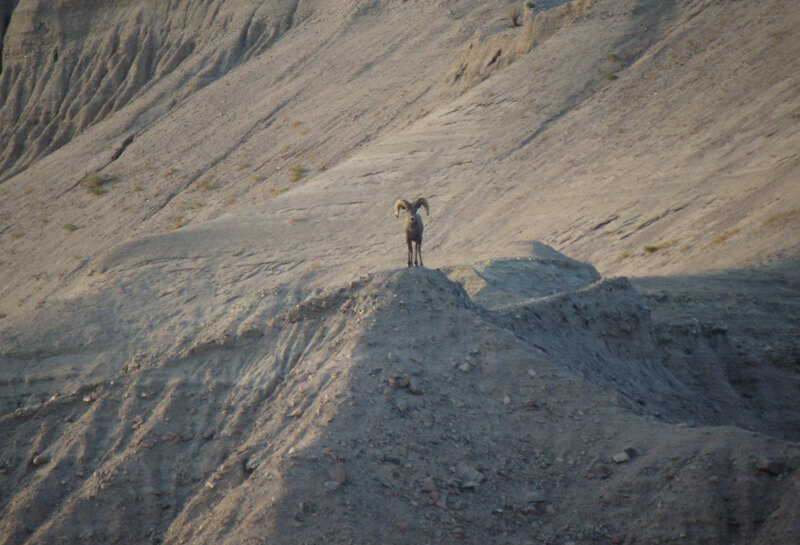 However with regards to depression it would probably be advantageous to the bighorn sheep to have the top of this depression even with the surrounding landscape. If a raised shoulder or crater like design was used any predators scent would be blown up and out of the depression and flow above the noses of the desert bighorn sheep leaving them unaware of any predatory presence. Given all the attributes and possibilities that terrain manipulation could provide I think it is worthy of development. And while there are many habitat issues that this technology could mitigate. It’s worthwhile talking about a few to get an idea of the possibilities and fuel the imagination. One use might be to direct the wild sheep away from an area that has livestock and other dangers such as urban sprawl. Another idea is to use this technology to guide the bighorn sheep to cross a two lane highway somewhere where the road is straight and level, giving both drivers and sheep a better chance of avoiding one another. Due to the lower cost this may be a more financially feasible remedy that an overpass. In the end this technology, with the applied imagination of many individual and some financial resources, will prove to be the way forward in mitigating many of the problems facing the various desert bighorn sheep populations in the Southwest.